Moonlight Magic in Shelburne Falls this Friday November 28th! On Friday, November 28th, starting at 4:00 PM, the annual Moonlight Magic in Shelburne Falls will be kicking off the holiday season! Join us for the lighting of the Village where stores, galleries and restaurants will stay open late for special holiday promotions. Vendors will be offering a rich assortment of items, including baked goods, crafts, delicious food, hot drinks and entertainment! 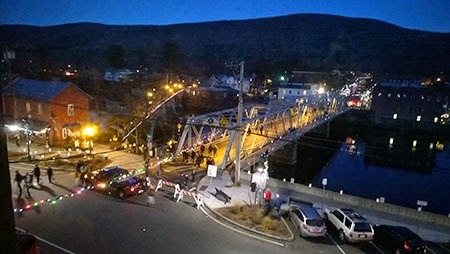 At 5:15pm, the annual Parade of Lights will cross over the Iron Bridge spanning across the Deerfield River from Buckland to Shelburne. Mole Hollow Candle Co. will again be providing 1,200 luminary candles which will line both sides of the streets throughout the village as Santa, Shriners Clowns, the Grinch, the Snow Princess, Sparky the Fire Dog and many more make their way through town. Many local vocalists and instrumental groups will perform at designated sites and roaming along the streets. To date, some of the artists that will be performing will be: The Magic Guy, Mega Dance Zumba, Ageless Waves of Rhythm and Pamela Means! At Memorial Hall Theater, children and their families can watch cartoons on the big screen from 5:00-8:00 pm courtesy of the Memorial Hall Association and Pothole Pictures. The Shelburne Falls Women's Club will hold their annual cookie shop at the Visitor's Center and Santa's Workshop with the Shriners Clowns will be in full swing at the Shelburne-Buckland Senior Center. There will be the opportunity to meet the Snow Princess and ride one of her ponies. And to remember this fun event, have your photo taken in a FREE photo booth at Greenfield Savings. Another highlight will be a chance to ride the brightly lit and beautifully restored trolley after dark. A ride on Shelburne Falls Trolley Museum's 1896 wooden, electrically powered trolley car brings back the nostalgia of an early+ 1900's holiday season and is worth a trip from anywhere in New England! Full of artisan shops, galleries, restaurants and attractions such as the historic Bridge of Flowers and the Glacial Potholes of the Deerfield River, come and see what the talk is all about. Thanks to the Academy at Charlemont, a shuttle service will be provided with stops at, Christopher's Grinders, Salmon Falls Artisan Showroom, Lamson & Goodnow Factory Outlet, Village Information Center, and Buckland-Shelburne Elementary School from approximately 4:00-9:00 PM. Attendees are encouraged to park at the Buckland-Shelburne Elementary School. The Iron Bridge will be closed to vehicular traffic so that folks can safely stroll back and forth enjoying events and open shops on both sides of the river. Thank you to our generous sponsors for making this event possible: Greenfield Savings Bank, TransCanada Corporation, Greenfield Cooperative Bank, People's United Bank, The Academy at Charlemont and Mole Hollow. This event is hosted by the Greater Shelburne Falls Area Business Association.